Link to full set of photos for this story. Link to full set of photos for Part 1. In the summers of my youth, the work was not done without having set aside an abundant supply of wood for those deep cold prairie winters as that was our primary source of heat. Here in Victoria, it’s not as deep and not as cold, but winter in Canada is still winter and as Canadians we love those crazy cozy log fires. 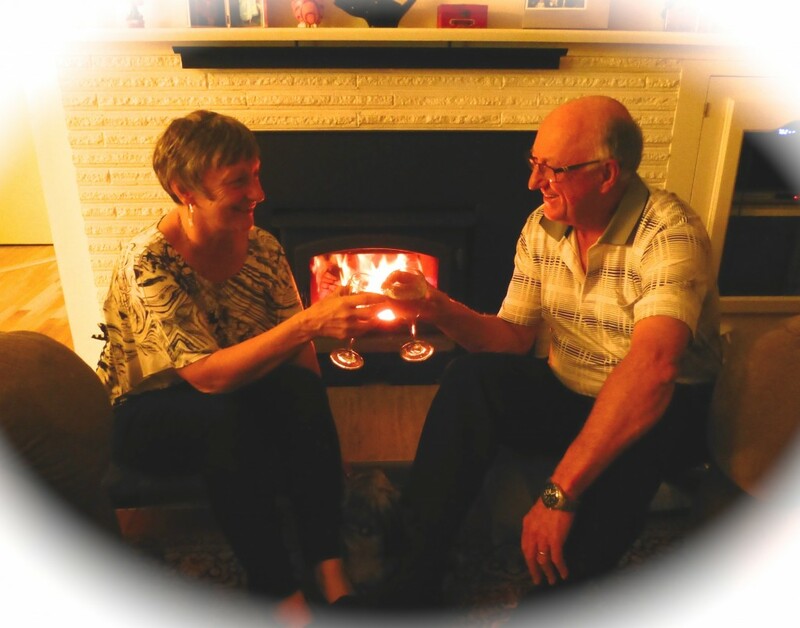 As Lynn and I recently installed wood burning insert our quest for good wood is ravenous. Drop a tree anywhere within a ten block radius and we hear it fall even when no one else can. With our gear ready and trailer hooked up, we can be on scene in less than ten minutes and first in, first cut and you own the tree, that’s the tradition. More than once we have been warned off by Hydro, but if we’re lucky and they’re busy, we can have the choice parts cleaned, cut, loaded and gone before they even arrive on the scene. 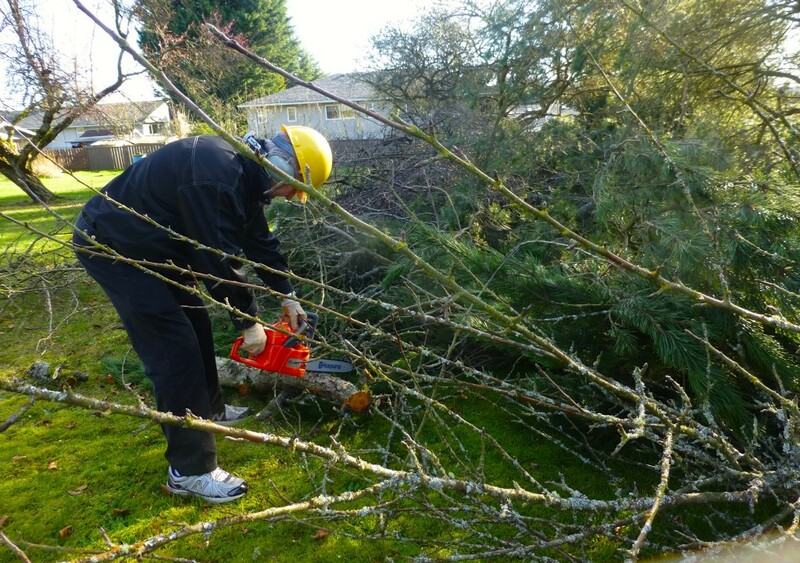 May 2015: Harold with his new Husqvarna chain saw working peacefully cleaning up the property next door. Early this spring it was our good fortune to get ahead of the storms when the property immediately across the street was being subdivided for three homes. As the one acre lot was filled with old fruit trees, maple, oak, cedar, fir, etc., there was more than enough for a two year supply and with a warm, dry summer, most of it would be ready for a fall start. So with chainsaw, hardhat and ear protection in hand, we began cutting, hacking, bucking and dragging that fine wood across the street to our front yard. But, as we all know good things don’t always last. 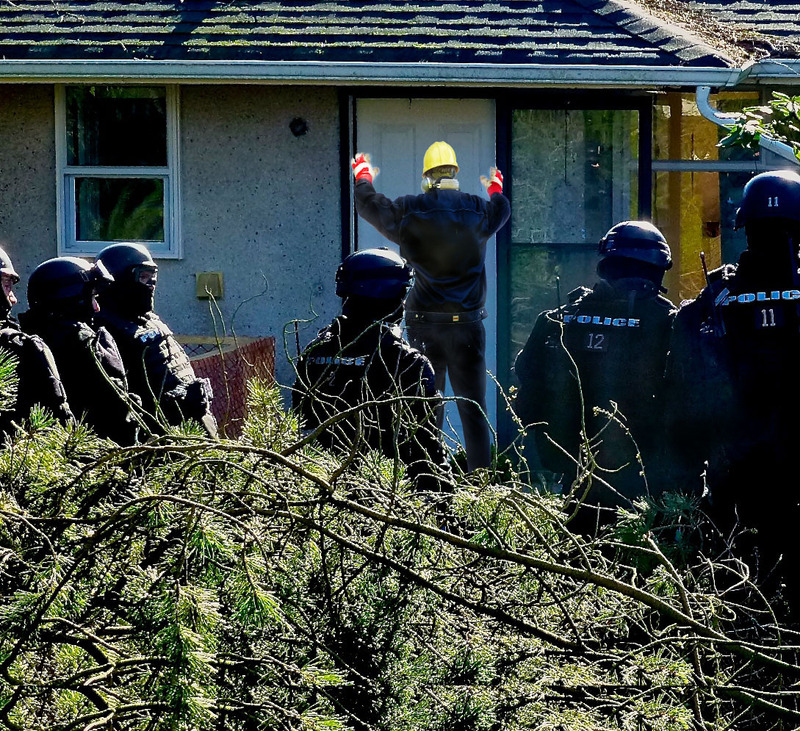 The cutting was moving along nicely until one day a full contingent of Joint Forces ERT members descended upon the site demanding to know what in hell we were doing attacking their house with a chain saw. As you might guess, at this point I was spread-eagled against the back door tighter than a stun gun implant. Giving way to automatic weapons, flash bangs, tear gas and pepper spray in bottles as big as dive tanks, seemed the only reasonable response. Running, at least at my age, was not an option and as I stood pasted to the back door Dad’s words rung in my head: “never bring a chainsaw to a stun gun practice.” I was just lucky Lynn was nearby to capture the moment otherwise no one would believe me. June 2015: With all those tasers pointed at my back, it’s a wise man who stands perfectly still. More photos of the raid in the attached album. After I was allowed to lower my hands and kill my chainsaw, I produced ID and explained I had permission from the developer to cut the trees. This helped to settle them down as much as those high testosterone ERT people can settle, and after that they even let us watch as they attacked that house with everything they had. The windows, doors and walls were putty in their capable hands and an hour after they arrived, every nook and cranny of that house had been searched with the precision of a brain surgeon. The next day they even sent in one of their heavy-duty police battering rams to finish what they started. Soon nothing remained of that poor little house, but better to go out with a bang than a whimper, I suppose. Later in July with our front yard covered in wood, it was our good fortune to have Lynn’s brother Barry and his wife Nancy stop by for a visit. As they have long been wood burning folks, Barry, who soon tired of losing 20 pound Springs at the Trap Shack out in the Strait of Juan de Fuca, suggested we take a break for a day, rent a splitter and get to work. It only took a few hours of bucking and splitting to have three and a half cords of split wood on the lawn, then over the last week of week of August and into September, Lynn and I had it all it tucked away in the three woodsheds sprinkled around our property. As we were also able to salvage a lot of small dry slash, we cut that up for stoking and from the old cedar fence we torn out, enough kindling to last at couple of years. 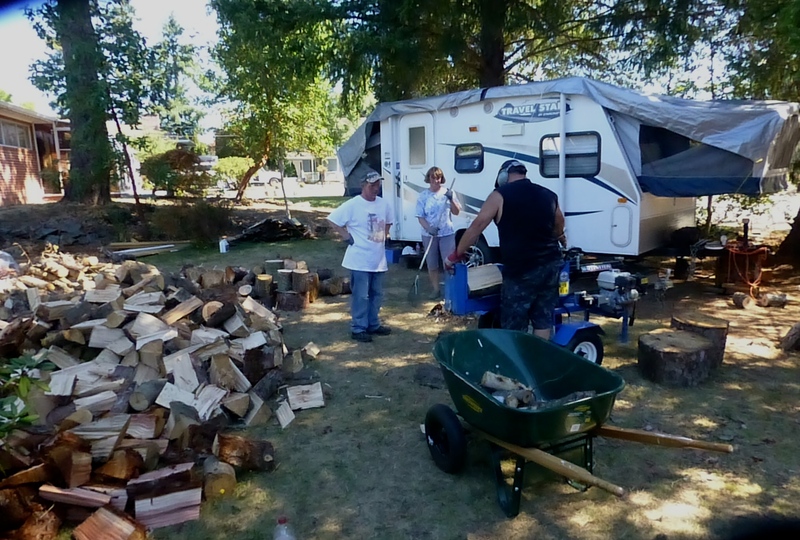 July 2015: Barry, Nancy and Jay working hard to clean up the last of the logs. Harold was in the background bucking. While we’ll probably never recover the cost of the insert by lowered electricity bills, the ability to have that bright warm fire going every day during the winter is worth every penny. Also, there is something invigorating about doing your own work to prepare things that you normally buy, things like electricity or natural gas. Clearly this is not possible for everyone, but for those who can, a little bucking, hauling and splitting is great exercise and gives one a sense of purpose. Now that September has arrived with somewhat of a vengeance (as those back East have reminded us), we need not wait for the normal chill of late fall to start piling wood on the hearth for those long evenings of playing cards, scrabble or just snuggling by the fire with a bowl of popcorn and a good movie. If you happen to like that sort of thing you are always welcome to drop by and share a little of that down home warmth from days gone by. The two of us are such lucky people. It was indeed was A Magical Summer and next up is a short story about our faithful helper, The Little Trailer that Could. 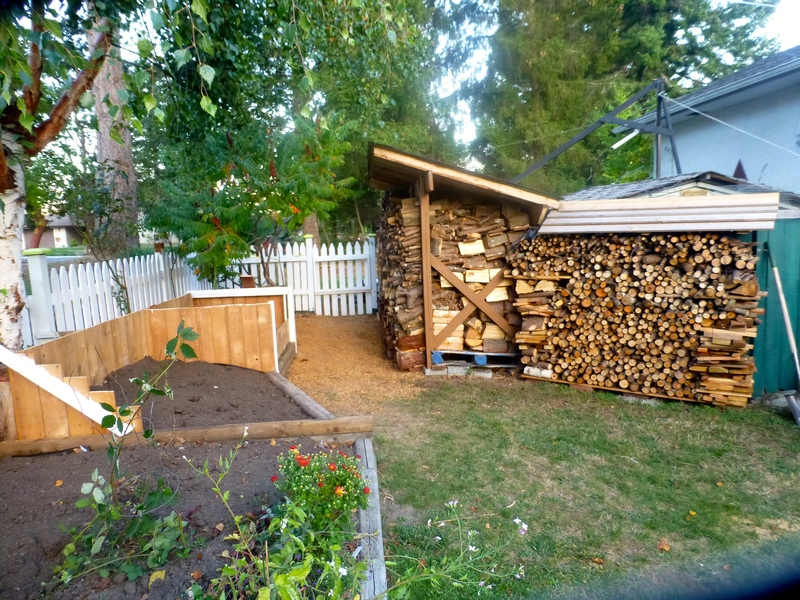 September 2015: Two of the four small woodsheds on our property.